Without a doubt, one of the best prix fixe lunches in New York City is offered by Gotham Bar and Grill. 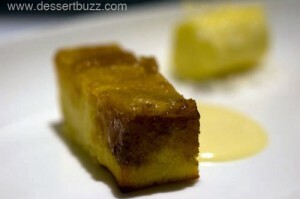 Twenty-four bucks gets you two courses plus a $7 supplemental dessert menu. All the service and quality of a fancy-pants restaurant without the expense (and fuss). 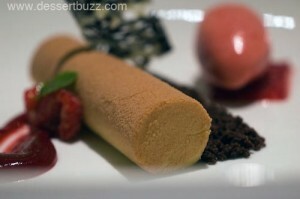 Of course, Gotham is also known for having superb plated desserts. Their chocolate cake has been on the menu, unchanged since the 80’s. Gotham chocolate cake: You can’t discuss the best chocolate cake in New York City without mentioning this classic from Gotham Bar and Grill. This was one of the first cakes to start going less-sweet and more bitter way before dark chocolate was all the rage. 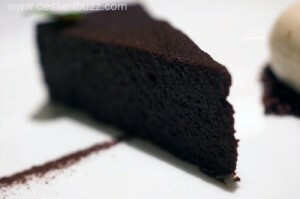 The texture of this cake is super smooth, somewhere between a thick mousse and a dark chocolate brownie. It’s not super-bitter like an 85% chocolate bar, just a bit less sweet than most chocolate cakes. 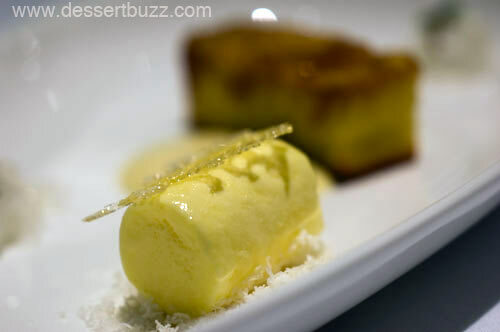 Pineapple upside down cake: This tiny (about 2″) cake delivers an intense pineapple flavor and is served with coconut ice cream and coconut anglaise, both of which are excellent. The cake portion is dense but it’ doesn’t make the dessert too heavy since the there’s so little of it. 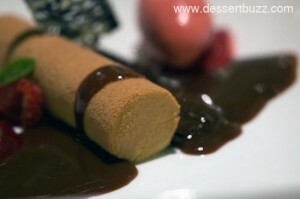 Chocolate peanut butter mousse: This mousse is ridiculously smooth and light. It doesn’t have a super-strong peanut butter flavor. Instead, it’s subtle. It’s served with dark chocolate caramel sauce and an awesome (seeded) raspberry sorbet. How many peanut butter desserts of any kind can you eat without feeling “stuffed” afterward? None, except this one. Recommended: Gotham chocolate cake, chocolate peanut butter mousse and upside down pineapple cake. Gotham Bar and Grill is located at 12 East 12th Street. Their website is here.